We are so happy to here in the San Francisco East Bay on the Urban Island meeting Alameda business owners and nonprofits. After 20 years in business, Clarity Web Studio relocated our headquarters office here in 2015 from the North Bay, where we provided web design, search engine optimization, and a wide variety of other marketing services for local business owners. Although we do business throughout California and across the U.S., we take great care and satisfaction in helping businesses in our local city prosper with SEO in Alameda. Our SEO goal for Alameda businesses is to promote you in organic search results so that you are visible in Google’s local 3-pack of map results, and also to get at least one listing on page 1 below that. As you can see in the Google results list example at right, we have multiple page 1 listings for Clarity Web Studio, as do our clients, and we can do the same for you. We expanded our services beyond web design in 2009 to include SEO, social media and analytics. In 2015, in response to what is happening in the marketing industry, we expanded again to include inbound marketing. This allows us to create marketing solutions that are seamlessly integrated and most productive. We still provide à la carte web design and SEO services for those who want a narrow focus. Never Sign Up for SEO in Response to a Cold Call! Many of us get those cold calls where the caller pretends to be affiliated with Google. They promise first page placement if you’ll only give them your credit card number. We’ve met clients with disastrous stories of fly-by-night telemarketing operations promising search engine optimization with instant placement on Google page 1 — expensive stories. One business owner is being billed $630/month for “services” that we’ve determined are non-existent. That particular SEO company hasn’t been able to produce evidence of actual work done, yet they claim they have a signed contract binding the client to a monthly payment. It’s so much safer to stick with a local expert who has integrity. 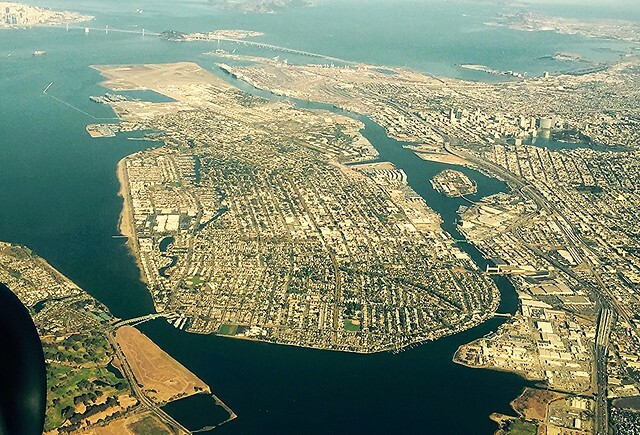 Here’s a beautiful aerial shot of Alameda by photographer Joel Caceres showing Alameda Island, Oakland to the right, and the bridge to the Bay Farm Island part of Alameda on the left. A little local history: Alameda was once a peninsula connected to Oakland primarily by marshes. You wouldn’t know it now, but on higher ground the peninsula and adjacent parts of downtown Oakland were once covered by one of the largest coastal oak forests in the world. The name “Alameda” is Spanish for “grove of poplar trees” or “tree-lined avenue”.